I was using HOMER to explore the difference in PV output when you change the orientation of the PV array when I got some unexpected results. The NE orientation gave more output than the north facing array (using a southern hemisphere situation). In looking at the detailed data exported from the program the Plane of Array solar radiation for the NE surface was higher than the N facing surface and there was considerable asymmetry between the NE and NW values and the E and W facing values (see the Summary worksheet of the attached Excel file). 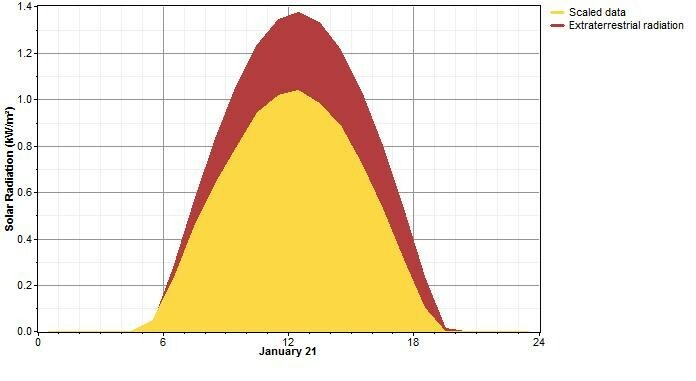 The solar radiation values that I am using appear to be reasonably symmetrical (from the monthly average plots on the solar resource page). Have you had any issues in this area? Can you shed any light on this because, in my understanding there should not be any major asymmetry between surfaces facing east and west of north. 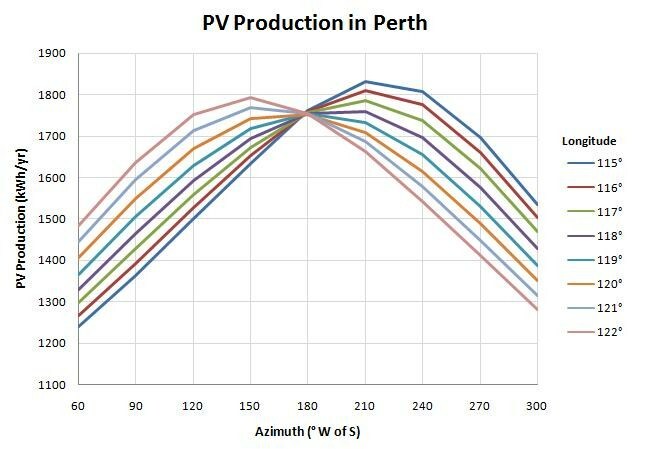 Good question about the asymmetry in the graph of PV production versus azimuth. I have wondered about this a few times before, but never really figured it out, so I investigated it in a bit more detail. I think it’s just an issue of time offset between the surface solar radiation that you enter and the extraterrestrial solar radiation data that HOMER calculates based on the latitude and longitude. Even a slight time offset between those two data sets can make mornings look much sunnier than evenings, or vice-versa. The fact that mornings look clear to HOMER could be because they actually are clear, or it could simply be an artifact caused by a time offset between the two data sets. I guess the latter. I think that’s why HOMER is telling you to orient the PV array slightly east, to capture more energy from those clear mornings. If I’m right about this, then changing that time offset between the surface and extraterrestrial data will cause a shift in the pattern of PV production versus azimuth, and we should even be able to see the opposite effect, where afternoons look sunnier than mornings, in which case HOMER should recommend a slightly westerly orientation for the PV array. An easy way to change that time offset is to change the longitude without changing the time zone or the surface solar radiation data. Increasing the longitude by one degree shifts the extraterrestrial data four minutes earlier. So in the above graph, increasing the longitude shifts the red curve to the left, without moving the yellow curve. Therefore increasing the longitude makes evenings look clearer and mornings look cloudier. I hope that helps explain the results. It’s hard to say exactly what you should do about this. If it was me, I would probably adjust the longitude to compensate for the measurement time offset between the surface solar radiation data and the local time as HOMER calculates it. That is, I would choose a longitude of about 120° so as to make the PV production peak at due north. But that might be ‘overfitting’ in the sense that there may in fact be some asymmetry in your surface solar radiation data, in which case the PV production shouldn’t necessarily peak at due north.